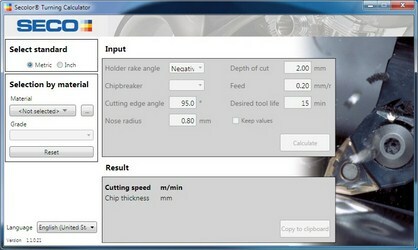 The Secolor Turning Calculator calculates recommendations for cutting speed, using he and Colding’s tool life equation. The cutting speed recommendations are only available for applicable combinations of materials and grades. The Secolor Turning Calculator includes all turning grades and chip breakers. Note that the Secolor Turning Calculator requires the Microsoft .Net framework version 3.5 SP1, also available for download.